of what one may find in your local movie theater, but with many more bells and whistles. 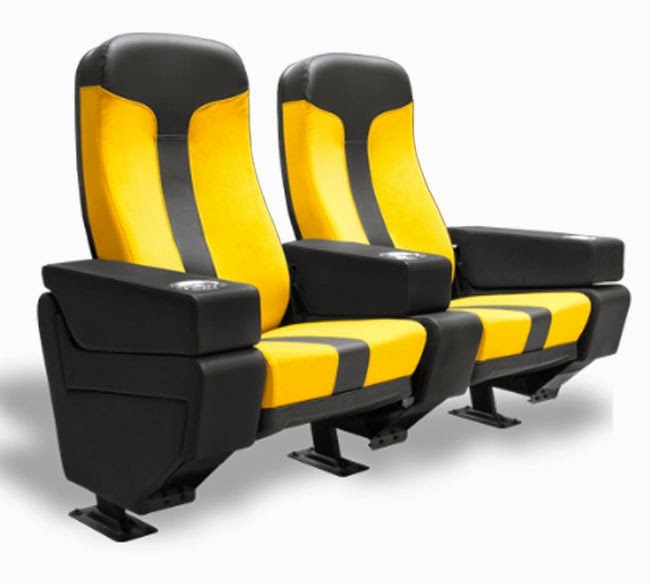 Movie seats are easier options when forward space is limited when compared to many of the full extension loungers that we sell like Octane®, Palliser and Berkline. The loungers all have full length foot rests that require a lot of forward space between rows. There are literally several hundred new movie seat styles available to us but we are showing just the top 27 styles based on customer interest and past performance. Features like rockers, tray tables and cup holders come standard on many of the models and their flexibility in color and cover combinations is massive. More importantly, these seats allow for the selection of various internal seating widths – not available on the loungers – so one gets the option of flexibility on the width too. Our best selling styles are the Regal Plus, Verona Plus, Finesse Plus and the Como movie seats. Every seat is manufactured here in North America and delivers from order date in 6-8 weeks. The Plus version seats offer expanded features like a bigger wider seat back, or more arm rest variations when compared to the standard version of that style. See the difference here between the Finesse Plus and the Finesse. With impeccable quality and absolute attention to detail, these seats are receiving a very warm welcome from our customers and we are excited that we can now offer this expanded collection to our starting in 2014.